Important: this is a concept only. What it shows is the Western Rail Trail extending to Anglesea St. It shows that by removing the flush median and moving existing car parking, magically there is space for a 3.6m-wide protected cycle lane. So the reason we don’t have protected bike lanes in Hamilton is not about car parking or space. What this does not show is a link to Girls’ High School or Wintec, where there are thousands of students using Ward St almost every day. 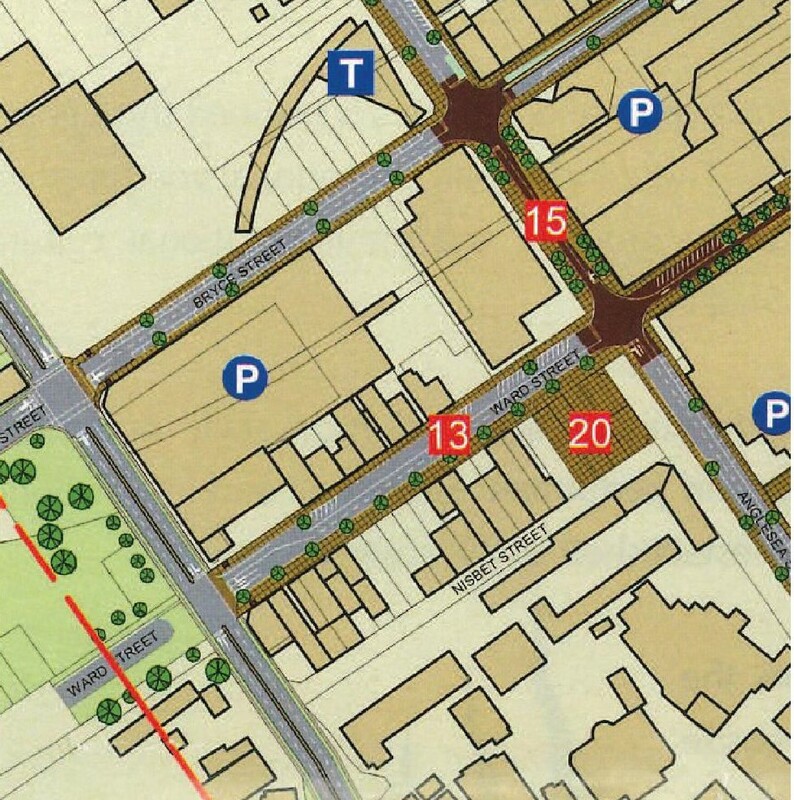 The double sided Gateway in the Stark concept does address the fact that there are people entering/leaving Ward St to both Ward Park and Girls’ High School and it shows a gateway for Ward St on both sides of Tristram St, thus allowing students a good link between the Western Rail Trail in Norris Ward Park and Hamilton Girls’ High School’s walking/bike entrance. 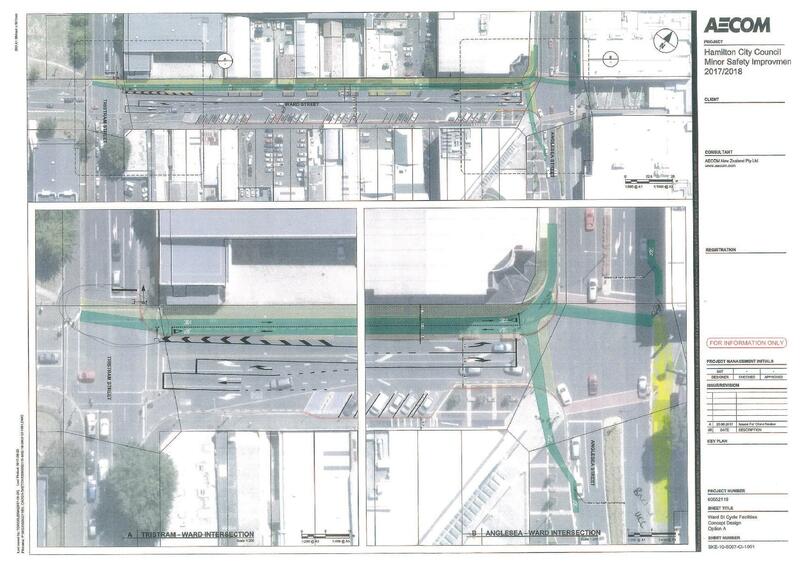 In Future 2020 Vision’s plans, Ward St and Wintec are clearly joined by a gateway. 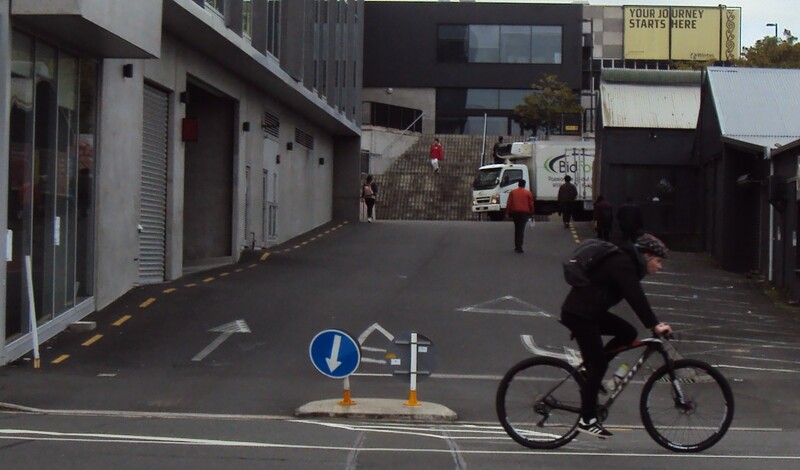 However, a building has now has been placed in the middle of the gateway, so for students, access to/from Ward St from/to Wintec is now limited to a what looks like a driveway. The loss of the Wintec/Ward gateway reflects the ‘local character’ of the decision makers. The challenge is: can drivers be asked to act as ‘guests’ as they drive through the Ward St area, allowing people walking be given priority. Given that Hamilton drivers don’t ‘see’ cyclists very well as it is, and that ‘shared’ zones (like the one that borders Garden Place and HCC) blur boundaries between road/ not road (confusing for adults, let alone children), I can’t really see drivers behaving like ‘guests’. Put that another way – the default is to have self-entitled car users. Bringing in the Western Rail Trail will help to shift attitudes – like the new crossing and mini roundabout on Lake Road slows down what was once a fairly fast paced road. I still like the Stark Concept too – more trees please! Less ugly car parks.